As promised I have put my new UP2 fitness tracker through it's paces. I have worn it in my everyday life for nearly three weeks. Not only have I used it to help me keep track of my steps but I have also used it to keep track of my sleeping habits, and as an alarm clock. Besides wearing it while I perform my daily mundane tasks, like washing dishes, I have also worn it while walking the dog, fishing and going on various hikes. By no means is this the top of the line model. It does have it's limitations but for what it is supposed to do it performs rather well. 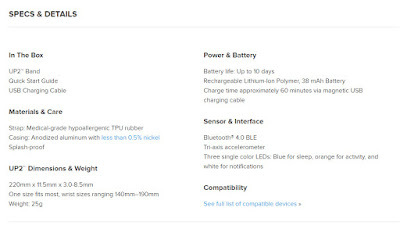 Below is a list of the specs and details taken from the Jawbone website. The Skinny: Testing this fitness tracker has been enjoyable. It allowed me the excuse to get out and do more things outside with my family. It also kick-started me back to my exercising routine that had fallen to the wayside since Christmas. 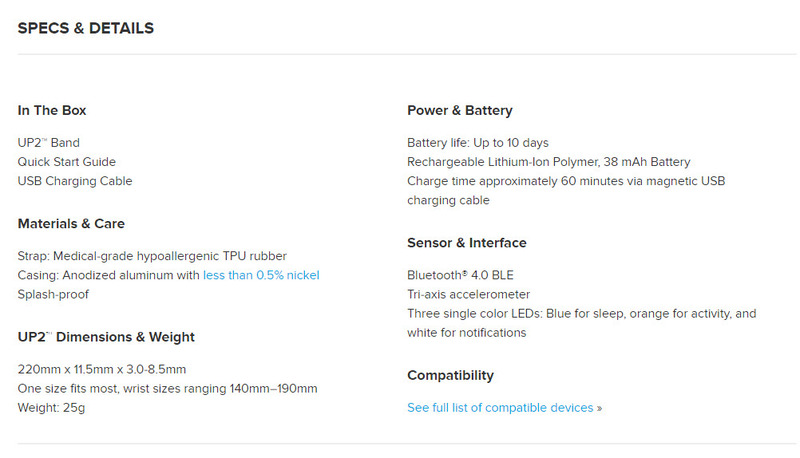 All the little things that irked me about my UP and Fitbit seem to have been addressed with the UP2. It's definitely not the Cadillac of fitness trackers, it doesn't have a screen to display your steps nor does it have a heart rate monitor, but it doesn't pretend to be. It's just a dependable workhorse. Hits: The biggest positive, besides that fact that it accurately captured my steps, is that it has a magnetic charger. In owning an original Fitbit I found I no longer had to struggle to get my fitness tracker to charge. You simply connect the UP2 to the charger and it is held in place by the magnet. Also of note, that is an improvement over the original UP as well as the original Fitbit, is that of how it sits on your wrist. I can barely feel it on my wrist because of the lightweight and stylish thin strap. I found that it didn't snag on my sleeves when putting on my clothes and was slim as to not stick out when putting my hands in my pockets. Misses: I had to open up the UP app to get my bracelet to sync the data to my phone. But as compared to the original UP I would rather sync wirelessly than have to plug it into the headphone jack. Also the band kept getting loose over time and had to be re-tightened. Lastly I had to go through 2 firmware updates, once when I first set it up and once about two weeks in and they were very slow. It was more of an inconvenience because of how much I liked the tracker. It felt weird having to take it off for such an extended period of time while the firmware updated. Ideal for: Serious calorie counters who don't want to break the bank and for the average health conscious individual who just wants help with tracking their exercise. Bonus: The UP app is how you interface with your UP2 on your mobile device. This app is incredible and I found the daily suggestions from the Smart Coach were useful and informative. If I had friends on the app I could see how it would help keep me accountable.